Holwell ended a turbulent week with a point after a stirring fightback against St Andrew’s in Andy Gray’s last game in charge. 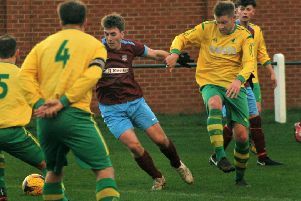 The Holwell manager had resigned following his side’s shock county cup exit to Asfordby in midweek, but returned with assistant Rich Armstrong for one last game to help out the club as they search for stability and another new boss. An exasperated Gray had put his decision to leave down to the attitude of some of his squad, and several players were absent for the visit of winless Saints on Saturday. But Holwell fielded a squad capable of at least competing with a St Andrews side itself struggling to get going this season. The visitors shaded an edgy opening with more possession and took an 18th-minute lead when an innocuous cross from the left was allowed to reach the back post. Hodgkinson did well to keep the ball in play and headed down for Sam Gent to shoot through a group of players. Holwell were unlucky not to level just two minutes later when Bitmead just failed to connect when a corner was swung under the bar, and Connor O’Grady then almost connected with Jamie Gilbertson’s telling cross from the right. But St Andrews were on top as the hosts fought to stem the tide, with Cragg making a great save to tip over Lewis Turland’s strong free-kick from 25 yards. The visitors were stronger in the tackle and quicker to the ball as Gent scored his second after 33 minutes with a well-taken goal from the edge of the box which left Cragg with no chance. Courtney Meade was running the show with strong runs and physicality causing the back four problems, and when left-back Lewis McLean sent in another cross from the left, Meade scored easily to make it 3-0 on 38 minutes. But Holwell were soon back in the game. Betteridge’s free-kick was tipped over by Saints keeper Jamie Aikiens, and moments later Mark Cowling tapped in a lifeline following a great move on the stroke of half-time. Sports started the second half steadily, but as the first, St Andrews forced the pace with only poor finishing stopping them from extending their lead. Holwell had resorted to the long ball to catch out the visitors’ back four, and it was game on 55 minutes when Ambrose broke the offside trap to round keeper Aikiens and make it 3-2. Saints self-destructed midway through the half when centre-back Ayoola tangled with Bitmead in the box and retaliated following his tackle. After a lengthy delay for referee Giles to consult his assistant, Ayoola’s indiscretion earned a red card and a penalty, while Bitmead was booked for the initial foul. Betteridge did well to keep his focus after the delay to dispatch the penalty to bring Holwell level. St Andrews were incensed and the continued complaints saw manager Trevor Wiltshire ordered from the dugout. The visitors did manage to steady the ship and still looked dangerous every time Meade got hold of the ball, but left with only one point, rueing missed chances and the dismissal which allowed Holwell to pick up a well-deserved point. The Holwell committee face a race against time to find another manager in time for Saturday’s trip to Lutterworth Athletic, while the squad is likely to be further depleted by the departures of players loyal to Gray. Holwell: Cragg, Gilbertson, Bitmead, Ridout (Bakrim), Stevenson, B. Smith, Betteridge, O’Grady, Cowling, Hazeldine, Ambrose. Sub not used: Harris.